With the killer bye week in week 8, wide receiver scoring was predictably dominated by some lesser owned players. J.J. Nelson narrowly missed being the top scorer due to a monster effort by Amari Cooper. Other names that can be found on the wire were near the top of the list as well and some of them figure to be there again in the coming weeks. Not only did Moncrief play well in his first game back, now T.Y Hilton is dinged up. Anyone that stashed or picked up Moncrief could be in for a treat ROS. Crowder is a legitimate threat to opposing defenses and the de facto number 1 wide receiver in Washington. LaFell was a big swing and miss in week 8. 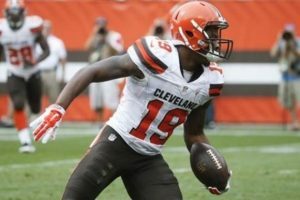 More on Corey Coleman below, he may be back in week 9. Coleman may be back this week, but he is still available in many leagues. See, more on Corey Coleman as promised. This recommendation is not much different from last week aside from the fact that Coleman is now on the cusp of returning to the starting lineup. The emergence of Terrelle Pryor has made it so opposing defenses will not be able to key on one player. The Browns are going to have to big play threats for the first time…maybe ever. This may be the last call for Coleman on the waiver wire so grab him right away and enjoy. According to coach Bruce Arians, Nelson is the number 2 receiver for the Cardinals at the moment. The numbers seems to back that up, with 11 catches for 163 yards and 2 touchdowns over the past two weeks. The Cardinals go on a bye in week 9, but Nelson should continue to see volume after that. As long as he keeps producing at a high level, it is likely that Nelson will be one of the Cardinals offensive pieces to own for fantasy purposes. Not yet an every week play, Hill is an intriguing option based on his big play potential. Two weeks in a row, Hill has been able to capitalize on a weak defense for some decent fantasy numbers. This trend may continue as the Chiefs face the Jaguars next. They also have Tampa, Atlanta and Oakland later in the season. He may not be a staple in anyone’s lineup, but in the right matchup Hill is a nice lottery ticket. High flying offense is not a term that will be used to describe Tennessee, but Matthews has carved out a place in it. With the abrupt retirement of Andre Johnson, that should mean more snaps and targets for Mattews. He has three touchdowns in four weeks and is obviously a big part of the team’s red zone game plan already. That should only increase as Mariota gains more trust in the offseason acquisition. Matthews and the rest of the Titans offense are continuing to gel and the coming weeks should bring more fantasy goodness.